(SPOILERS) How quickly can you tell if a Best Picture Oscar winner is one for the ages? As often as not, they’re consigned disposable, crowd-pleaser status (The King’s Speech, The Artist, Argo) or branded with the opprobrious idea that a plain underserving movie got garlanded (A Beautiful Mind, Chicago, Crash). And, as often as not, there are pressing concerns dictating the choices the Academy members made on any given occasion, over and above what they simply thought was straight-up best (not to mention, in recent years, the skew of the tier system ballot coming into play). I have but one film left to see out of this year’s nine nominees, and as such I think I can now comfortably conclude that, while it’s a well-made movie, Moonlight definitely didn’t warrant the top honour. Structurally as problematic as Lion, with the same issue of differing levels of accomplishment in respect the performances of the lead character, it best illustrates Barry Jenkins’ talent as a director. And, of course, he didn’t win. On a tonal level, Moonlight probably bares closest comparison to Manchester by the Sea, in terms of both being closely-observed character dramas. But even then, it’s much less beholden to calculated turns of plot, attempting as it does the conceit of a naturally unfolding narrative. Jenkins has taken on the influences of European cinema in their most permeating, expansive sense, such that he allows scenes and characters to linger and breathe, rather than being driven by the engine of where his story is heading. This is immensely beneficial in the first two acts – the picture is divided into three periods in Chiron’s life, each played by three different actors – but proves a stumbling block to the last, where the same approach, now without an externalised conflict and so reliant on a performer unable (or by the design of his character’s stoicism) to deliver, leaves it curiously flat and listless. Chiron’s internalisation means that, particularly in the opening act, you’re unsure at first if Alex Hibbert is playing his part well or is rather as inexpressive as the character’s younger self. This doesn’t matter too much either way, as both Mahershala Ali (as the surrogate father Juan who passes through Chiron’s life, atypically of such narratives neither predator nor user but laden with a gnawing, unvocalised guilt over his own choices and a desire to redress them in some small way, a position that, for all Chiron’s rejection, surely subliminally influences his own future career choice) and Naomie Harris (as his junkie mum Paula, an impressively unsympathetic performance, and illustrative of the quality of Best Supporting Actress nominees this year) more than compensate in providing dramatic substance. The latter’s most compelling scenes come during the second act, also by far the most commanding sequence, but Ali more than deserved his statuette for his sensitive portrayal of the dealer who supplies Chiron’s mother and encourages the boy to accept who he is (the biggest complement you can pay him is that you miss his presence throughout the subsequent acts). If there’s a problem here, it’s that the more emotional moments don’t quite play; Chiron confronting Juan and leaving when he knows the truth carries the marks of a performance that couldn’t quite be made in the edit. On the other hand, Ashton Sanders’ teenage Chiron is an outstanding performance, carrying the impression of his younger self but with the intervening decade of bullying, unstable mother and closeted sexuality having weighed ever heavier upon him. The key to this passage is surely the universal recognisability of such rites of passage, however extreme in Chiron’s case, and the conflict, isolation and burden that accompany these formative years. The strongest element of the third act is Andre Holland’s hugely winning performance as the adult Kevin, a character who has featured significantly in both previous episodes of Chiron’s life and represents his first (and only) gay encounter. But Holland’s heavy lifting is unable to rescue a meandering vignette in which Trevante Rhodes may be schematically justified as a buff incarnation of the still recalcitrant main character (all the better to hide your true nature beneath), but is unable to lend dramatic weight to his existence. This Chiron seems to exist in a bubble of the filmmaker’s mind, and without evidence of how he lives, his existence (aside from visiting his mother and teaching an under-dealer the tricks of the trade, both of which feel rather schematic) there’s little to latch onto. The picture wanes and loses its impetus, even given that it offers the culmination of Chiron and Kevin’s arc, rediscovering each other and expressing their feelings openly, and with it the subdued observation that has been the cornerstone of Jenkins’ approach unravels. 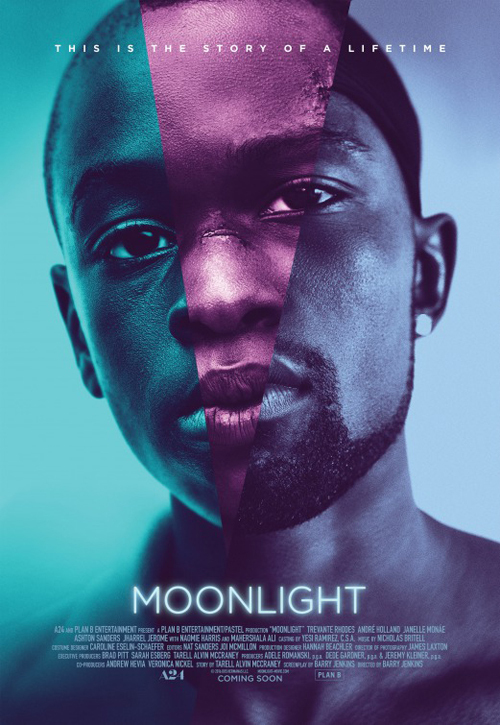 At its best, Moonlight is an acutely insightful study of a passage to adulthood (in its way, charting the same course as another Oscar nominee, Boyhood, did a few years ago), powerful, affecting and intensely well observed, accompanied by a fine score from Nicholas Britell that has an almost Philip Glass quality (the classical influences here are generally better integrated than in Manchester by the Sea). The picture’s problem isn’t (as some criticisms have levelled) that it doesn’t have an ending, it’s that its third act lacks sufficient measure, that as its lead character takes control of his destiny, so his journey becomes less potent. If Rhodes’ performance had matched Holland’s, Moonlight might have carried through, but after the dramatic crescendo of his teenage years, Chiron is left in a place of minimum impact, dramatically and in terms of audience investment. Doubtless Jenkins will continue writing-directing in whatever he does next, but most impressive here are his choices in the latter field, in particular sound design (silence is used to powerful effect in crucial scenes) and his willingness to explore character through unforced observation and mood rather than exposition or calculated dramatic incident.